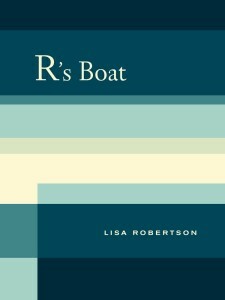 Bildet av Rousseau liggende på rygg i en robåt er utgangspunkt for en undersøkelse av utsigelsesperspektivet i R’s Boat: boken består utelukkende av setninger hentet fra Lisa Robertsons egne notatarkiver, likevel kan leseren ikke peke på noe samlende, autentisk jeg. I stedet skapes et sansende, flytende perspektiv – et slags kognitivt kontinuum, sagt med Robertsons egne ord. Med seriene av løsrevne setninger fortsetter forfatterskapets åpne gransking av kjønn, form, teori og poesi. Robertson vrir på bekjennelsentradisjonen etter Rousseau og Montaigne; R’s Boat er hennes bud på en «tom» selvbiografi. LR: I’ve always been completely seduced by sentences, certainly. I think I’m a sentence-lover before I’m a writer. Much of my earlier work has been testing the internal structure of sentences as wildly psycho-sexual-social units. But here I wanted to find a way to include extremely banal, flat, overwrought and bad sentences, by devising a sequencing movement that could include anything. My thought was not to judge, but to float the disparity of the units in a continuum. I think what happens is that the caesura, the space between, becomes extremely active, more active than the sentences themselves are. This has the effect of making any sentence semantically legible in several registers—the meta-textual, as you point out, may be one of them. 1 LR: Walking home tonight, having just bought a used copy of The Painter of Modern Life, I thought of the poem as a conversation between the pelvis and the pavement. That thought really made me want to write. CEB: Talking about movement, the epigram from Rousseau in R’s Boat has gotten a lot of attention, but I’d like to ask about the book’s second epigram, from Michèle Bernstein. «We have now reached a stage of experimentation with new collective constructions and new synthesis, and there is no longer any point in combating the values of the old world by a Neo-Dadaist refusal. Whether the values be ideological, artistic, or even financial, the proper thing is to unleash inflation everywhere.» Can you comment on why you included Bernstein? She was involved in the Situationist Internationale. Has that movement been a major influence for you? LR: I wanted to see Bernstein and Rousseau together, like two flaneurs. I still strongly identify with the call to inflate everything, as a tactic—stylistic, ideological, you name it. It’s really what I do—I inflate language. And yes, Michèle Bernstein has been a big influence since the late 80s when I read about her in Lipstick Traces. A few years ago I translated part of her novel, All the King’s Horses. She supported Debord with her freelance writing. That has given me a certain courage. I’ve been a freelancer since 1994, when I closed my bookstore. I also feel the need to counteract the heroical role Debord has assumed within the historiography of Situationism, which was after all, collective. Bernstein was not a minor participant, but thoroughly present as a writer and a thinker. 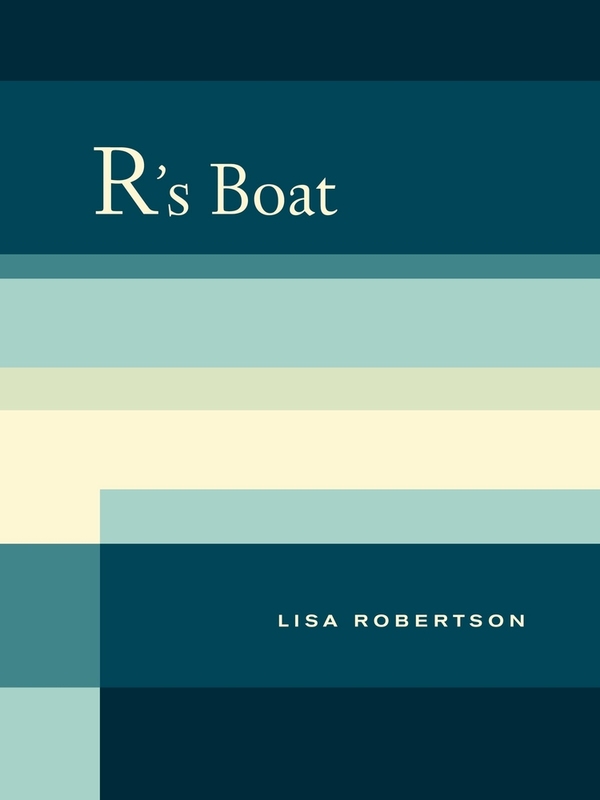 Lisa Robertson er poet, født i Canada, nå bosatt i Frankrike. Hun debuterte med The Apothecary i 1991, og har siden utgitt en rekke diktsamlinger, i tillegg til essays. R’s Boat utkom i 2010. Robertson har også redigert tekstsamlingen Revolution: A Reader (2012) sammen med Matthew Stadler.